As Major Kevin MacAllister carries out his plan, emotions run high and tensions mount as he prepares to sacrifice his friends, upstanding career, and the love of his life—all to pursue his dream. Now only one question remains: Will he be successful, or will his dream die with him in the open sea? “Set in 1993, Vernon’s debut novel is part The Day of the Jackal and part The Rock (the movie, not the former wrestler),” as stated by Kirkus Reviews. In this international espionage thriller, an extraordinary nuclear terrorist unfurls a plan with the power to instill fear in millions of Londoners and bring the British government to its knees. Ray Vernon grew up in Ireland as the youngest of eight children. After graduating from Cork University, he lived in London, Germany, Italy, and eventually the United States, where his sales and marketing career took him to more than 80 countries. Vernon is now a real estate broker who serves Boston’s South Shore and Cape Cod. He resides in Plymouth, Massachusetts. 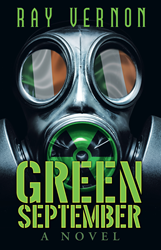 “Green September” is Vernon’s debut novel. To learn more, please visit http://www.rayvernon.com.